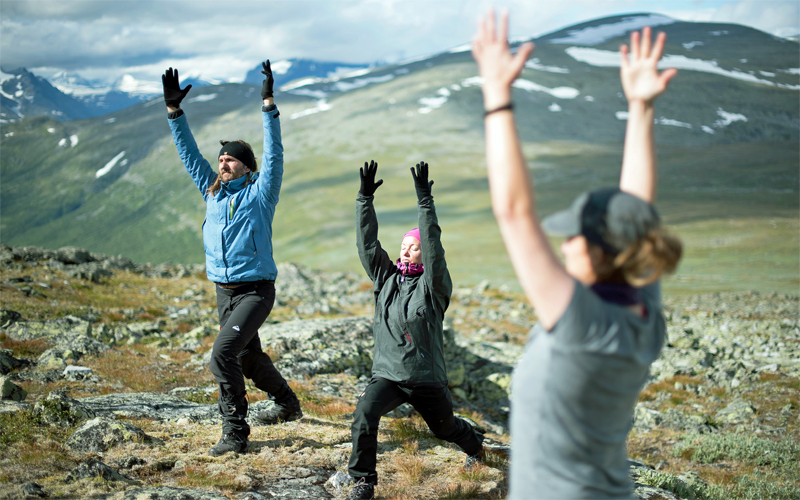 Far away from stress of modern life, we welcome you to Laponia retreat yoga hike. 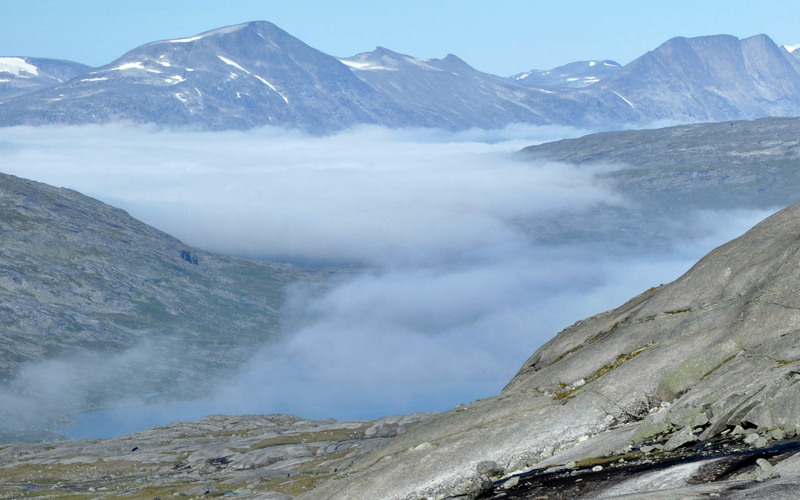 Our hike takes us to the heart of the UNESCO world heritage site Laponia where the pointy peaks of Sarek meet the rolling hills in Padjelanta national park. The hike will be altered with yoga and meditation along the trail but also yoga classes in the morning or in the evening. 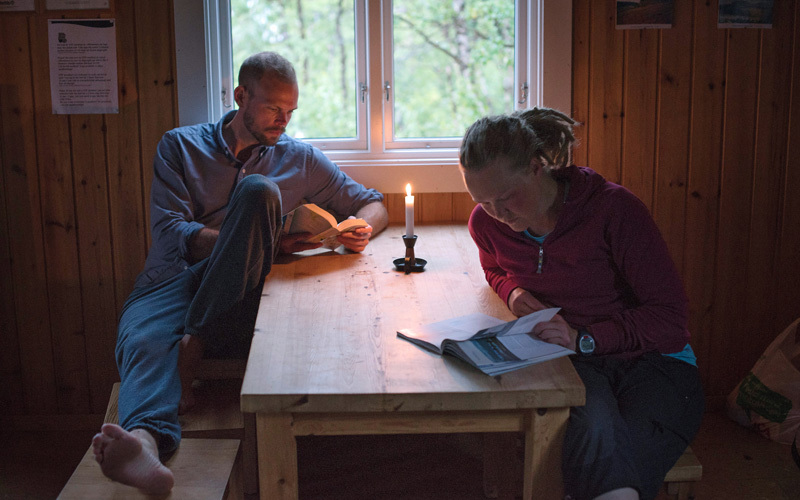 During our hike we live close to nature and stay in cozy mountain cabins without any electricity or running water. The world heritage site Laponia is protected for its unique combination of culture and nature. The Sami people have lived here thousands of years and a trained eye can find both hunting pitches and old settlements. During the week we’ll have dinner in a modern Sami settlement and learn more about the Sami culture. 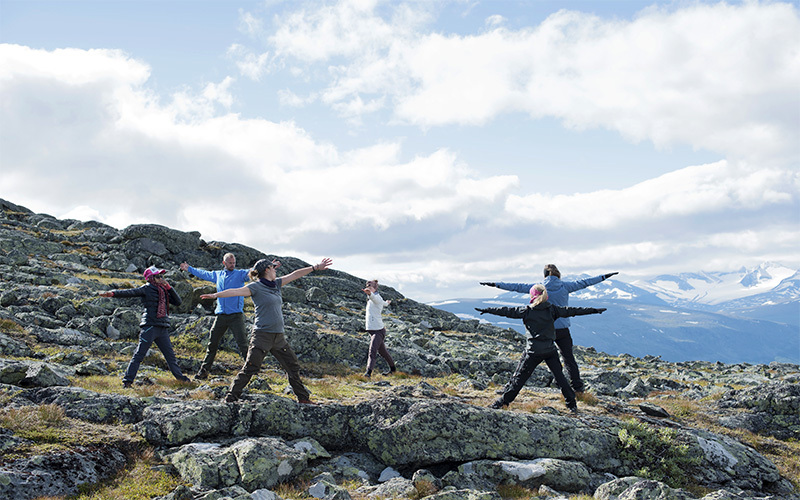 …are looking for a yogic experience combined with hiking in the northern Sweden. You should be able to hike between 10-18 kilometer per day in terrain with moderate differences in altitude and with a backpack of around 10-12 kg. You need no earlier experience from neither yoga nor meditation. All the classes can be adjusted to your level. Please contact us if you have any questions regarding your physical ability or experience level. Our yoga classes will be led by Petra Kalla from Sacred spine yoga therapy. She is born and raised in Gällivare but have now found home in Järna south of Stockholm. Most of her yoga classes will be practiced in the outdoor, which strengthen the connection between your body and the nature. The vast landscape around you will inspire and help you to be present in the moment. If your daily live includes a higher pace and lots of demands this will be a welcome break for your mind. We practice Hatha yoga that strengthen and creates space in your body. We will focus on both mental and physical recovery. The yoga classes will be embedded into your hiking experience. Through yoga, qigong and breathing exercises we set an intention for the day and prepare our bodies for the hike. During the day, we have yoga breaks depending on the weather and the need of the group. This will soften our muscles and give us access to more energy. In the evening, relaxing exercises and meditation set us up for a complete recovery and a deep sleep. When in the mountains it is important to get good food with lots of energy and Laponia Adventures are cooking meals from real ingredients. One this tour the menu will be based on vegan food with additional milk and local meat/fish products for those who would like that. A typical day starts with a Swedish breakfast and in the evening, we cook dinner together. As long as weather permits we will have a longer break during the day to re-energize with a lighter lunch. During our time in the mountains we stay in cozy cabin without electricity or running water. We all help with the daily duties as carrying water or chopping wood to the fire. Even if the cabins are simple they provide the most essentials as heat, beds, blankets and everything we need for cooking and eating. Outhouses are often situated within 100 meters from the huts. The last day of the tour we will stay at Saltoluokta mountain lodge where you will share room with other participants of the group. You will of course have access to both water-toilets and showers. 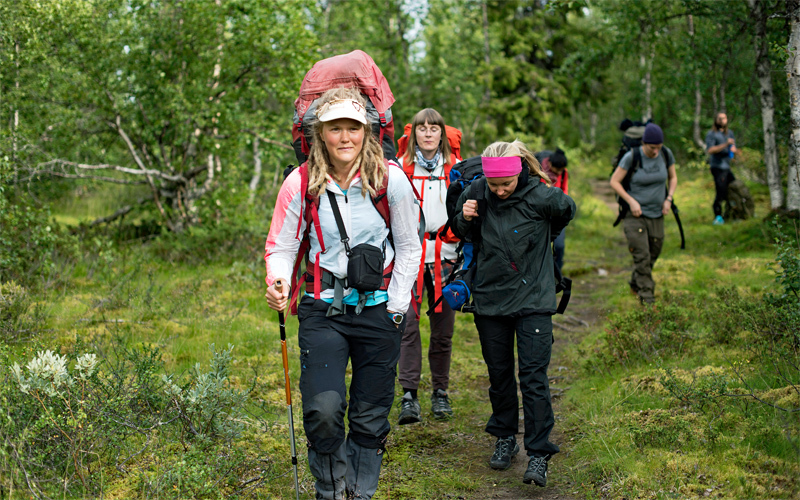 We work with local guides who have good knowledge of the culture and history in Laponia. They are all certified guides trained in wilderness first aid or live up to the same standard or higher. On this hike, we are also happy to have the opportunity to work with a professional yoga therapist from Sacred Spine Yoga Therapy. Ritsem is a small town by the end of a winding mountain road. We’ll meet around lunchtime (13.00) for an introduction before we take the boat across Áhkájávrre. After a 45 minute boat ride we hike the last kilometers to Akka cabin by the foot of Akka, the queen of the mountains. We have dinner together and depending on the weather we finish the day with a yoga class, either outside or in the hut. We arrange transfer from the airports in Luleå. Pick-up latest 8.00. We start the day with a refreshing yoga class before we have breakfast in the hut. Our trek today takes us over the bridge across the powerful river Vuojatädno and continue through a sparse mountain birch forest. 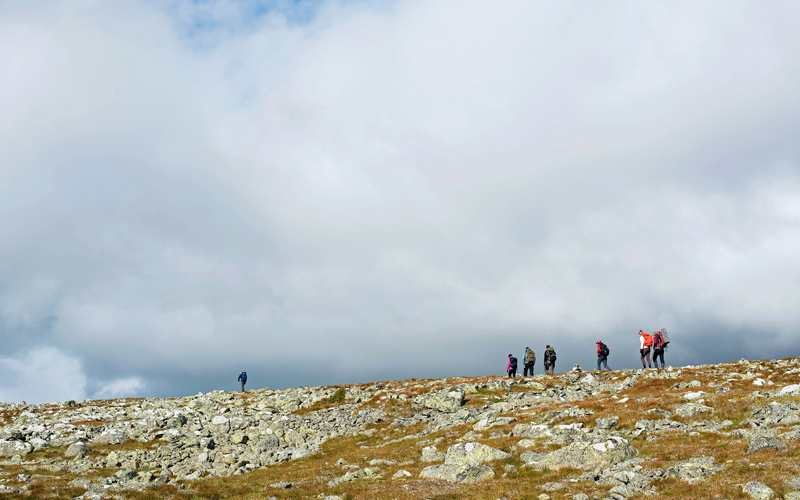 The trail lead us along the foot of the majestic Áhkká mountain, passing the point where the three biggest national parks in Sweden meet and finish in Kisuris cabin. We have dinner and end the day with a yoga class to give potentially sore muscles some attention. In the morning we do yoga and make a day hike in the area around the hut before we head down to the lake Kutjaure. A boat takes us across the lake to the Sami settlement on the other side where we have dinner cooked over the open fire.. We hope for good weather to enjoy Yoga outside, maybe on top of a mountain. We wake up our bodies with yoga before we make a plan for the day. Not far away from the hut there is an impressive waterfall and if we choose to continue further there is a mountain from where you can see far in to both Padjelanta and Sarek national parks. We take some time to enjoy the view, a yoga class or meditation before we roll back down to the lake again for a well deserved sauna. Our last hiking day takes us north-east through a wide U-shaped valley. If weather permits there will be a yoga class in the mountains before reaching Vaisaluokta where we will stay for the night. We pass a Sami settlement and visit their church built with traditional material that you’ll find in the area. Before leaving Vaisaluokta we enjoy the healing power of nature and have yoga class and meditation by the lake. A boat will take us across Áhkájávrre back to Ritsem from where we continue by bus to Saltoluokta mountain lodge. We’ll give your body and mind time to transition back to the modern society. When arriving Saltoluokta we make a short hike before we enjoy hot showers and a sauna followed by a three-course dinner in the restaurant. We start the day with a morning yoga class. After finishing the organic breakfast in the restaurant at Saltoluokta mountain lodge it is time to say good-bye and wish you safe travels home. A boat will take you across lake Langas and we recommend you to arrange your travel home from Kebnats bus stop on the other side. A normal day offers temperatures from 10 to 25 degrees. Temperature in July can drop down to 5 degrees and we could get strong winds and a lot of rainfall. There can be mosquitos but normally they don’t peak until later. The food will be based on vegan food but please let us know if you have any dietary restrictions or food allergies. We may need to adjust the route and the itinerary according to the conditions for the local reindeer herders, as well as current weather conditions.